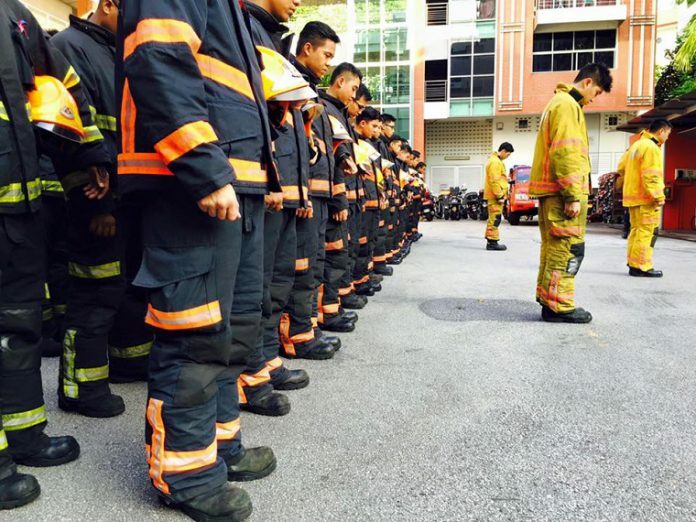 A Singapore Civil Defence Force (SCDF) full-time national serviceman (NSF) died yesterday after he was found unconscious at the bottom of Tuas View fire station pump well. This incident comes just two weeks after an army NSF passed away after “displaying signs of heat injury” following an 8km fast march at Bedok Camp. The Force revealed in a statement today that the NSF, Corporal (CPL) Kok Yuen Chin, had gone into the pump well to celebrate his impending ORD with his squad mates. It added that a “mishap” arose due to activities which are prohibited and that two SCDF regulars were arrested today by the police. The pump well is a reservoir of water that fire station personnel use to test the pumps of fire engines and for training purposes. CPL Kok “fell into” the pump well but did not resurface. The SCDF said that a number of personnel jumped in to find him but failed. The Corporal was only pulled out from the well after the water in the pump well had been drained. “SCDF is saddened by his death and extends our deepest condolences to his family. We are providing all necessary assistance to the family during this difficult time. “We continually educate our personnel, including during their foundation courses, briefings at recruit and specialist levels, as well as at periodic intervals, to make clear to our officers the risks of such activities and that they are prohibited.